My daughters’ school “Friends of” group raises funds by selling cakes at sports gatherings and parents evenings. This time we were asked to provide something for a concert given by an orchestra of young musicians from around the Gulf. I looked online for something speedy to make that was little and nibbly and could be handed round in the interval. I landed on the Marie Claire site – not one of my usual haunts I’ll admit. Tomato tarte tatins looked quite speedy and didn’t have too many dietary no-nos (pork doesn’t go down well in mixed company here). 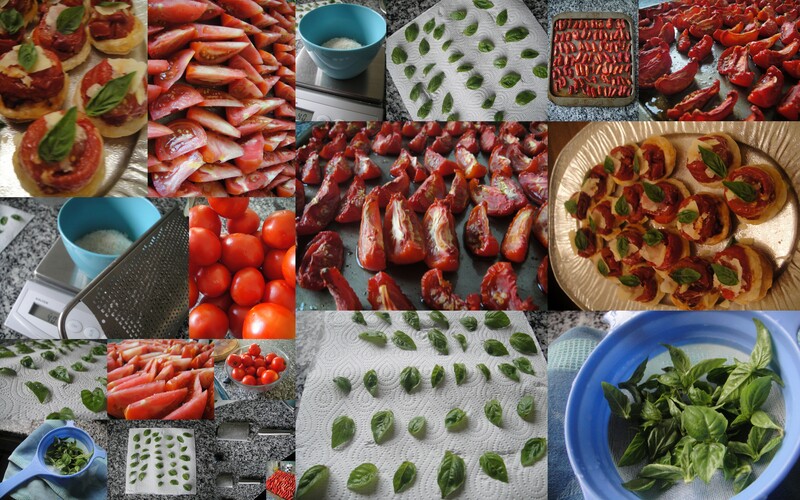 A closer look at the recipe revealed that 500g of sun-blush tomatoes were required – shock, horror! This would cost about ten quid (15USD) from the supermarket but as fresh, local tomatoes are really cheap, I got out my knife and put the oven on really low (50 C) to make my own stove-dried version. Not quite so speedy but hey. I thought I’d test out the new slideshow feature from WordPress. Recipes below. 1. Preheat the oven to 200C, Gas 6. Lightly oil 2 x 12 hole mini muffin trays. Drain the sun-blushed tomatoes and divide between the muffin trays. 2. Scatter the Parmesan over the tomatoes (strongly recommend a micro-grater for parmesan). Roll out the pastry to ½ cm (1/4in) thick and cut out 24 rounds with a 7cm (3in) pastry cutter. (I found a 6cm fitted better). Press a pastry round over each tomato base and bake for 10-12mins until golden and puffed. 3. Cool in the tin for a few mins then invert and place on a serving dish. Top each with ¼ tsp of red onion relish, a Parmesan shaving and a basil leaf (I picked all the little leaves from the tops of my basil which does the plants good too). I hurled them onto a nasty foil tray, took a quick pic under electric light and ran out of the door so you might like to look at the much more sophisticated marieclaire photo. You could use this filling with tiny tarts using shortcrust pastry for a more satisfying crunch. A smear of tapenade would work well instead of the relish; add a caper as well and have deconstructed puttanesca tarts. Congratulations to the fantastic young musicians by the way – the concert was great. New slide show or a more static rendition (see below)? What do you prefer? Let me know.